The Persona Lifecycle is a field guide exclusively focused on interaction design's most popular new technique. The Persona Lifecycle addresses the "how" of creating effective personas and using those personas to design products that people love. It doesn’t just describe the value of personas; it offers detailed techniques and tools related to planning, creating, communicating, and using personas to create great product designs. Moreover, it provides rich examples, samples, and illustrations to imitate and model. Perhaps most importantly, it positions personas not as a panacea, but as a method used to complement other user-centered design (UCD) techniques including scenario-based design, cognitive walkthroughs and user testing. The authors developed the Persona Lifecycle model to communicate the value and practical application of personas to product design and development professionals. 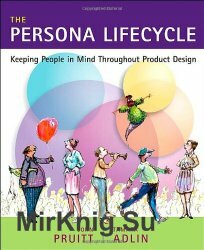 This book explores the complete lifecycle of personas, to guide the designer at each stage of product development. It includes a running case study with rich examples and samples that demonstrate how personas can be used in building a product end-to-end. It also presents recommended best practices in techniques, tools, and innovative methods and contains hundreds of relevant stories, commentary, opinions, and case studies from user experience professionals across a variety of domains and industries. This book will be a valuable resource for UCD professionals, including usability practitioners, interaction designers, technical writers, and program managers; programmers/developers who act as the interaction designers for software; and those professionals who work with developers and designers. * Presentation and discussion of the complete lifecycle of personas, to guide the designer at each stage of product development. * A running case study with rich examples and samples that demonstrate how personas can be used in building a product end-to-end. * Recommended best practices in techniques, tools, and innovative methods. * Hundreds of relevant stories, commentary, opinions, and case studies from user experience professionals across a variety of domains and industries.